Preheat oven to 375 degrees Fahrenheit. Line a cookie sheet with a silicone mat or a piece of parchment paper, or coat with non-stick spray. In a large bowl, mix together the four cups flour, sugar, baking soda, and salt. Add the butter and with a pastry blender or your fingers, squeeze and mix the butter in with the flour mixture until the butter is about the size of peas. In a medium bowl, whisk together the buttermilk, egg and orange zest. Make a well in the middle of the dry ingredients and pour in the wet ingredients. Stir with a wooden spoon just until the dough starts to come together. Strain any remaining liquid from the cranberries and add them to the dough. Fold in the cranberries until just combined. The dough will be wet and sticky. Spread some of the remaining flour onto a flat surface and turn the dough out onto it. Sprinkle a bit more flour over the bread and begin kneading, adding more flour as you go, until the dough is smooth and uniform. Do not over mix!!! Form dough into a round loaf and place on the baking sheet. With a sharp knife, cut an "X" into the top. Bake for 45 - 55 minutes, or until golden brown and the bread sounds a little hollow when you knock on it. You can also try using a cake tester just to be sure - when it comes out clean, it's done. Let cool for at least 10 minutes, then slice, butter, and serve. Wrap tightly with plastic wrap; keeps at room temperature for up to 3 days. In the bowl of a standing mixer fitted with a dough hook, proof the yeast by combining it with the warm water, olive oil and sugar. Allow the yeast to become active, approximately 5 to 10 minutes or until foam starts to develop. Combine the flour and salt. Turn mixer on low and slowly add the flour to the bowl. When the dough starts to come together, increase the speed to medium and allow the dough to knead for 10 minutes or until smooth and elastic. 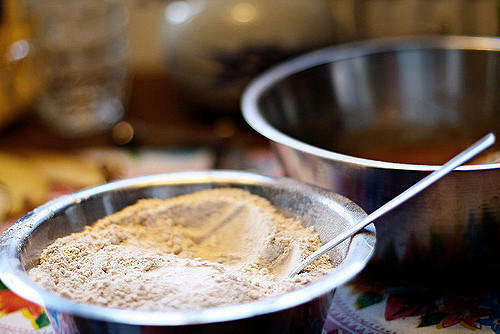 Add more flour as necessary to form the dough and prevent it from sticking to the sides of the bowl. Turn the dough out onto a work surface and fold over itself a few times. Form the dough into a round and place in an oiled bowl, turn to coat the entire ball with oil so it doesn't form a skin. Cover with plastic wrap or damp towel and let rise in a warm place until doubled in size, about 45 minutes. Sprinkle a copious amount of corn meal on a bread peel. Punch the bread dough down and turn in onto a floured work surface. Stretch or roll the dough out into a rectangular shape approximately ½ inch thick. Transfer to the peel and sift a light coating of flour over the top to help keep the dough moist. Allow the dough to rest for 15 minutes. Preheat an oven to 400°F fitted with a large pizza stone on the center rack. Dimple the bread with your fingertips and brush the surface with olive oil. Sprinkle a generous amount of Fleur de Sel on the bread and transfer from the peel to the pizza stone. Bake until golden brown, about 20 minutes. Use the peel to remove the baked bread from the oven and cool on a wire rack. Remove from the bowl and knead by hand on a floured surface for about 5 minutes. Place in greased bowl, cover, and let rise in a warm place until doubled in bulk, about 60 to 70 minutes. On a floured surface, punch down the dough and shape into desired shapes. Place on a parchment paper-lined baking sheet. Cover again and let rise until doubled, about 30 to 40 minutes. Preheat the oven 350°F. Bake for about 20 minutes or until golden brown. Remove from the oven and brush with melted butter before serving.